Beading Needles Size 10/13, Piecemakers  - $2.00 : Yarn Tree, Your wholesale source for cross stitch supplies. Item 5633. 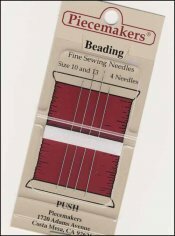 Size 10/13 Piecemakers Beading Needles. Long, thin needles with a sharp point for sewing beads on fabric and stringing beads. The size 10 needle is 2 1/8” long; the size 13 needle is 1 7/8” long. From Piecemakers. Twelve cards per box, four needles per card. Priced per card. Please order by the number of cards.